Spain and Portugal during the rule of Charles III. 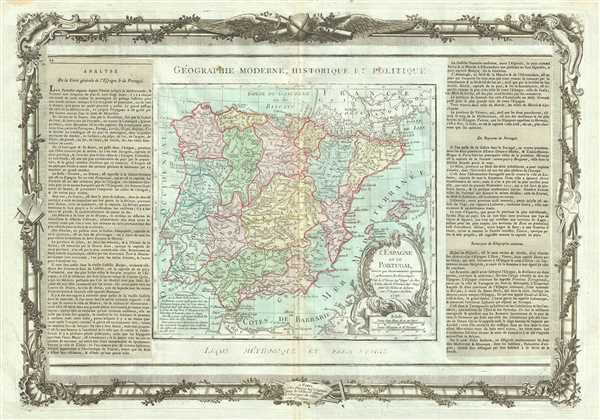 This is a beautiful 1786 map of Spain and Portugal by the French Cartographer Louis Brion de la Tour. It covers the Iberian Peninsula including the islands of Majorca, Minorca and Ibiza and depicts the provinces as they appeared when the map was drawn. A former kingdom, this area eventually merged with its neighbors, and today comprises the autonomous region of Castile y Leon in the northwest, and Castilla-La Mancha and Madrid, in the center and south of the country. Spain at this time was under the rule of Charles III (1759-1788), a classic enlightened despot whose reforms ushered in a sustained period of Iberian prosperity. Unfortunately, the reforms of Charles III were overturned during the reign of his mentally handicapped son, Charles IV (1788 to abdication in 1808). Dominated by his wife's lover, Manuel de Godoy, Charles IV embarked on policies that regressed Spain to its pre-Charles III state. Spain was ultimately cajoled into an uneasy alliance with France and was consequently blockaded by the British. Charles IV's vacillation, culminating in his failure to honor the alliance by neglecting to enforce the Continental System, led to Napoleon's 1808 invasion of Spain and triggered the Spanish War of Independence. A beautifully engraved title cartouche adorns the bottom right quadrant of the map. To the left and right of the map are paste downs of French text with remarks and description of the map. Surrounding the whole is an elaborate decorative border featuring floral arrangements, surveying tools, elaborate baroque scalloping, and a winged globe. This map was issued as plate no. 22 in the most deluxe edition of Desnos’ 1786 Atlas General Methodique et Elementaire, Pour l’Etude de la Geographie et de l’Histoire Moderne.